As real estate prices continue to reach historic highs, Controlled Environment Agriculture (CEA) is emerging as a solution for landlocked urban and suburbanites. This article will feature an entry-level greenhouse that can fit on a 1,000 ft2 footprint and can be operated as a part-time job. We will take some time to understand which crops are appropriate, seasonal variations, and market pricing for several popular crops. Finally, we will take a look at the startup costs involved and the potential profits. Marketing a farm isn't easy for every farmer, and Nick Burton (the Grower's Coach) understands that better than most. He has also overcome many of the struggles of social media marketing for small farmers. In fact, Nick is a farmer himself - he grows both hydroponically and in the soil. [Live event] - Can Indoor Farming be Profitable? Bright Agrotech is providing transparency and powerful resources for aspiring hydroponic farmers. As we have covered in previous sessions, a number of trends are colliding to allow small urban and suburban growers to enter the produce market. Missed the live event? Don't worry, we have you covered. If you are looking for real information, you have come to the right place. Indoor farming promises to bring fresh, local produce to your neighborhood. In this session, Dr. Storey shares numbers for an 1,800 square foot vertical growing system. How much can one person grow? How much does energy and lighting cost? It can be hard to plan your indoor farm without some insight into these costs. If you missed the live event, we have you covered! Check out the video recap below, and be sure to stay tuned for future live streams to keep up to date on the latest news and conversations in indoor agriculture! Why should farmers care about how their herbs are treated after harvest? I recently read the results of a survey and study on the post-harvest care of herbs. This is obviously an important topic for anyone buying produce. Different herbs have different needs, but most people are unaware of how those needs differ between species. This leads to mistakes that reduce shelf life or even ruin produce before it can be used. We’ve all heard of crowdfunding. From Kickstarter movie promotions to college students posting their GoFundMe pages on their Facebooks, it’s become pretty ubiquitous in our communities at large. But what can crowdfunding do for you, a modern farmer? Barnraiser is more than crowdfunding. It’s a social and funding community that allows its members to further propel the food movement forward by backing projects, celebrating their stories, and connecting to innovators of sustainable food and farming. Read more: Who is Barnraiser? Those of you familiar with indoor growing know that the most common form is to take horizontal planes of production and stack them one on top of the other. Even though small businesses around the US create two thirds of the jobs in the country, getting capital is almost always reported as one of the top three constraints to growth. Can you believe it? We can. We see people trying to start farm businesses all the time struggle to get start up funding. Often this delays their business plans by months, years, or even makes it altogether impossible for them to build a farm. But if only a third of those small businesses could grow - if they could just hire one additional employee - the US could be at full employment. One of the main obstacles is getting funding. 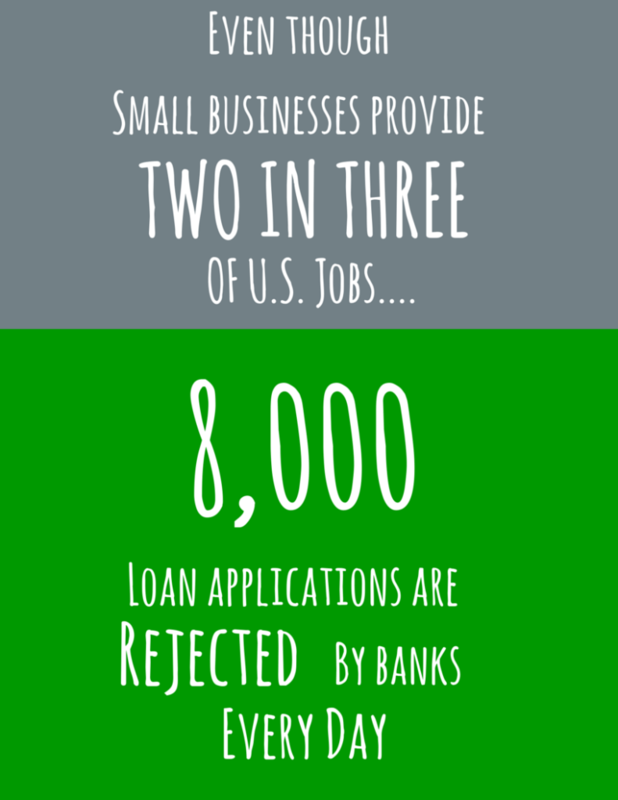 And yet every day eight thousand business loan applications are rejected by banks. We're all familiar with CO2.